Your domain name be one of the most valuable pieces of intellectual property your business has. Choosing a domain name is the most important task to establish your business online. Your domain name needs to be both customer and search engine friendly. You need to make sure that you choose a domain name that makes sense to your business. 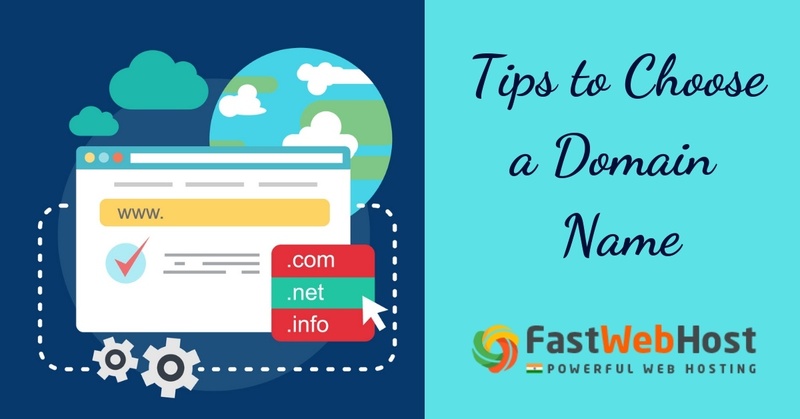 Here are 8 effective tips that help you choose the most perfect domain name for your website. When you are ready with your business idea, next step is to register your domain. make sure that you choose a domain name which is easy to type and spell. See that your domain name is easily spelt and can be transferred clearly over phone as well. For example, Names that has a number 7 in it, it’s a tough task for us to vocalize it, if it is ‘7’ or ‘seven’. Also be careful while using words like “affect” or “effect” , “dessert” or “desert” they are often confusing and misleading . Your domain name must be short and precise. People are very impatient to either read or type a lengthy name, so a short name which is easy to remember comes in very handy. Short domain are so concise and easy to remember. People shouldn’t have a hard time remembering your name. For example, Let’s say you are hosting a business that sells kids clothing, “kidsclothing[. ]com” or kidsboutique[. ]com are more preferable compared to “buychildrenkidsbabiesclothing[.]com”. Your domain name should be relevant and it should make sense to your business. It's better if your domain contains keywords related to your business. It should be catchy and should give a sense of your product or service as a whole. .com is the most commonly used extension, people tend to think that a website generally ends in .com. Therefore you will have a tough time making people understand the other extensions( .org, .biz, .me etc). So it is better if you buy a .com. It is not a compulsion though. A domain name with .com is very hard to be available or is too expensive therefore sometimes you are obligated to go for other extensions. There are websites that does so well without a .com at the end. It is preferable to go for .in .net extensions. People mostly find it difficult to spell or understand numbers, also it is very hard to dictate a hyphens. So too many of them makes your domain name very clumsy. Try to avoid numbers and hyphens or at least minimize their usage. For example, “birthdaygifts[. ]com” is preferred by most customers rather that “birthday-gifts[. ]com”.This could also lose a lot of traffic. Using an existing domain name can be tricky. There is always a risk of getting into legal troubles. People also get confused and you might as well lose your identity. Always try to be unique and make sure your domain name is available and not owned by anyone else. FastWebHost provides you with the most perfect and unique domain names at very reasonable price visit us at https://www.fastwebhost.in/domain-names.html and get your domain name. In many cases your domain name might have a commonly misspelt spelling. It is advisable to buy domains with those misspellings and link them back to your site to avoid other from using your ideal domain name. If you have opted for a domain name that says “xpress[. ]com” people often misinterpret it as “express[. ]com” so it is advisable to buy both of them. Checkout all the social media platforms to ensure that no other thing exists with domain name and it is not popular enough for people to get confused with your domain name. If you are planning on establishing yourself on social media, try to post yourself with the same name on every platform. Choosing a domain name is considered to be one of the most important aspect of your online business. It is a really tricky job as well. Following the above mentioned guidelines can help you choose a suitable, befitting and a perfect domain name. You can choose a domain name for your business from FastWebHost. It has perfect domain search tool for selecting domain extensions.